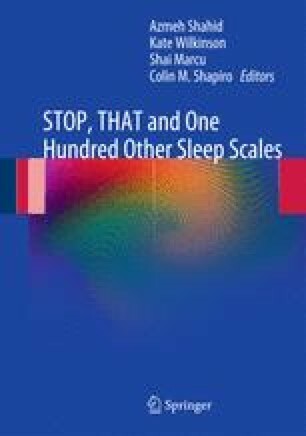 Consisting of 24 statements regarding obstructive sleep apnea (OSA), the instrument targets nine different dimensions of belief about the disorder, including: perceived impact of OSA, ­outcome expectations, continuous positive airway pressure (CPAP) acceptance, and willingness to ask for help. Smith and colleagues  designed the questionnaire as a tool for investigating treatment compliance in apneic individuals. As some have postulated that more positive beliefs and attitudes about OSA treatment are associated with improved compliance, higher scores on the test may be linked to a greater commitment to the treatment process.